. Knit So Simple: Do you hear what I hear? have you ever held your yarn and just simply KNEW what you had to knit with it? 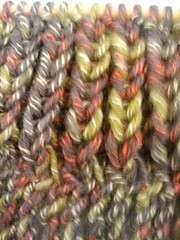 the pattern, the texture, the colors dictated and inspired, and at times even SCREAMED just how it should be knit? well, i recently found that to be true when Rachael picked this skein of yarn to compliment a new coat for this winter. i tried a seed stitch and actually had a nice little scarf unfolding but the results just weren't the "IT" i had hoped for ... and then i saw IT in my mind ... the tassels, the deep rib stitch ..... and after several attempts and rip outs and do-overs i finally found IT .... and it has been flying off the needles - - and i'm LOVING it !!!!! i finally decided on 17 stitches. and did i mention that i tackled 'fringe' for the first time! I cast on 1 stitch, pulled out 18" for fringe and attached that back, cast on another stitch and pulled out another 18" for fringe and followed that same procedure until i had 16 fringes and 17 stitches loaded. I purled back the entire row by purling 2 together (one cast on and one fringe loop) and then ending with a single purl stitch. Knit 2, *K 1 in the stitch BELOW, purl 1*, repeat * *to last 3 stitches, K 1 in stitch BELOW, end with Knit 2. Knit 2, *purl 1, K 1 in the stitch BELOW*, repeat ** to last 3 stitches, purl 1, end with Knit 2. Follow this pattern to desired length and then end with a full Purl Row. To make fringe, i measured 18" of yarn and folded it back up towards the needle. I then squeezed this end on the needle and grabbed the long loop and twisted it 20 times. This resulted in the yarn twisting up on itself. I slipped the end loop onto the needle and did another cast on ... I'm sure there are probably better explanations but i found that this worked for me and after trying to 'eyeball' things i found an envelope that served as the perfect template for measuring the loop each time. Listening to my yarn has been so much fun ....hearing the comments that others have made when they see it has helped to confirm that it really does pay to be still and listen. No need to be afraid of the quiet ... sometimes the silence screams loud enough for us all to hear!